Stephen Young gave a talk this month at an event hosted by Investec Wealth and Investment for Independent Financial Advisors (IFAs). For many commentators, and those present in the splendid surroundings of The Ned, formerly the Midland Bank HQ, autumn 2018 is significant as the 10th anniversary of the Global Financial Crisis. But 2018 is also the tenth anniversary of the publication of Nudge, the breakthrough book that propelled behavioural economics to global recognition by policy makers and regulators. All the more ironic, considering that Richard Thaler has recently commented that it was a struggle to find a trade publisher for Nudge, which he co-authored with Cass Sunstein. Despite its relatively recent prominence, the talk on ‘The Rise and Rise of Behavioural Economics’ (edited version of slides here) started with the surprisingly long evolution of behavioural economics - beginning in the 18th century and came bang up to date with Daniel Kahneman and Richard Thaler - although both have won the Nobel Prize for economics, only one, Thaler, who won in 2017, is actually an economist. The talk covered the big ideas of the main thinkers before looking at how these ideas are now being used to understand consumers’ financial decision making, showing that complexity, biases and cognitive errors can lead to flawed decisions. The result of financial decision-making being biased and error-prone is that governments and regulators are more likely to intervene in choice behaviour, to increase the likelihood that consumers will make better decisions. The conclusions showed how regulators, including the UK’s Financial Conduct Authority, are increasingly using insights from behavioural economics to understand what leads people into flawed decisions, and how to avoid them. The result is financial regulation that more accurately reflects how people actually behave rather than the sometimes unrealistic assumptions of standard economics. Behavioural economics has become mainstreamed, and is informing policy-making and regulation in the UK and around the world. It’s already affecting the UK financial services sector – expect to see more of it. As an aside, Stephen enjoyed meeting, and being introduced by the BBC’s Nick Robinson, who went on to share his perspective on the politics of Brexit. No surprises....it’s complicated! So pleasing to find out that Nick is a fan of behavioural economics. Stephen Young (that's me!) is looking forward to teaching on the new one week module at Brighton and Sussex Medical School aimed at health care professionals, managers, commissioners and leaders actively involved in, or with an interest in financial and economic aspects of health care in the public, private or voluntary sectors. The module, which starts on Monday 5th February 2018, is delivered on five consecutive days, each of which presents a theme in health economics and health behaviour. As well as putting health economics in a theoretical framework to help healthcare professionals, healthcare decision-makers, or policy makers make choices on how to decide the best use of limited health resources, the module will also consider the scope for market and demand management by showing how behavioural economics and social marketing can help modify the behaviours which contribute to many health problems. This module will consider the challenges facing the healthcare sector using economic concepts such as supply, demand and the market to understand resource allocation. These concepts are then applied to the provision of healthcare services and the promotion of good health. The module considers the advantages and disadvantages of different approaches to financing and organizing health services. Students are introduced to the main methods of economic evaluation (cost-effectiveness and cost-benefit analysis) and shown how they apply to decision-making in healthcare. We will then spend a day each on social marketing and behavioural economics, before moving on to the final day, an interactive session when students will select a key issue or problem and apply the concepts, theory and tools presented in the module to analyse the problem and critically evaluate possible solutions. The Nobel prize for Economics (technically, the Sveriges Riksbank Prize in Economic Sciences in Memory of Alfred Nobel) has previously been awarded to academics working in the field of decision-making, psychology and economics (Herbert Simon in 1978 and Daniel Kahneman in 2002). 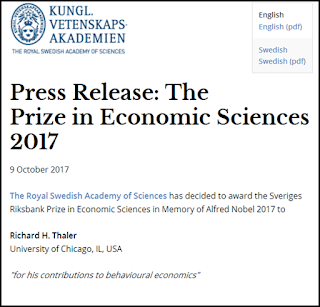 But the announcement last week that the 2017 prize would go to Richard Thaler, was the first which explicitly mentioned the award being for “contributions to behavioural economics." Ten years ago media images showed queues of anxious depositors in British high streets as the crisis at Northern Rock, the first run on a British bank for around a century, became the clearest sign that all was not well in the financial system. A year later, the collapse of Lehman Brothers signalled the full blown emergence of the Global Financial Crisis. These momentous financial events coincided with my new job as an economics lecturer at Brighton Business School, University of Brighton. Economics 101, which I was teaching to first year undergraduates, was hard-pressed to explain the most momentous economic events in living memory. Which was why I turned to other schools of thought, including behavioural economics, launching what turned out to be a series of popular modules on the subject. 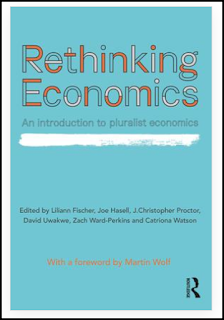 Fast forward a few years, and I was invited by the folks at Rethinking Economics to contribute a chapter on Behavioural Economics to a forthcoming reader, aimed at providing an accessible introduction to different approaches to economics and highlight the diversity of economic thought. The book, which has just been published, introduces new and diverse ideas into undergraduate economics and places the mainstream of economic thought side by side with more heterodox schools. 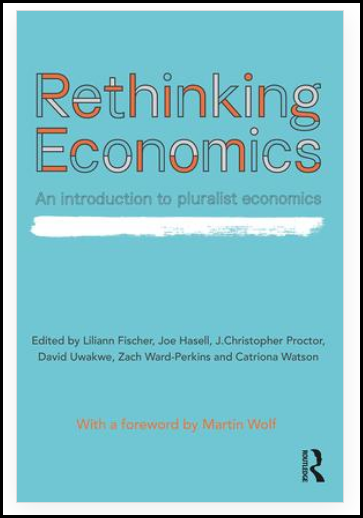 According to the publishers, Rethinking Economics: An Introduction to Pluralist Economics is “a great entry-level economics textbook for lecturers looking to introduce students to a broader range of economic ideas, and is accessible for people outside academia who are interested in economics and economic theory. Can’t say fairer than that. 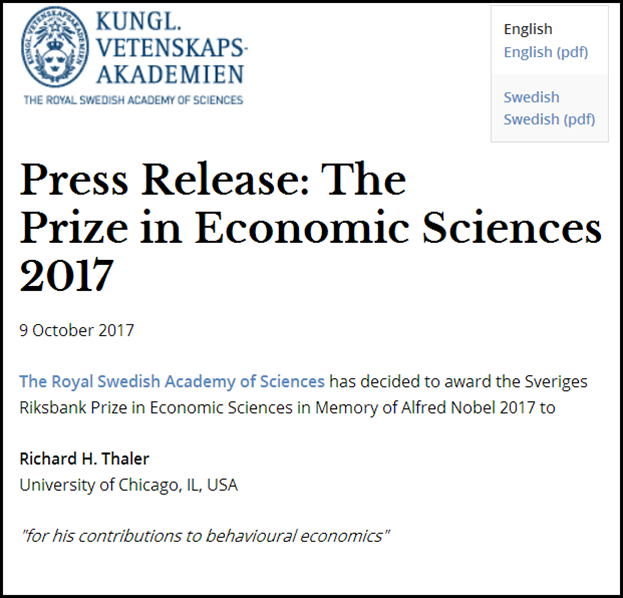 According to Richard Thaler’s Nobel Prize citation, behavioural economics has become “a mainstream component of the economics profession.” It’s going to be interesting to see if the rest of the “economics profession” agrees! Can Behavioural Economics Make Us Happy? Economics was memorably described as ‘the dismal science’ by the Scottish writer and philosopher Thomas Carlyle in the early 19th Century. So it’s fitting that, in the early 21st Century there could be lessons on how to be happy from behavioural economics and the behavioural sciences. Happiness by Design was written by fellow Brightonian (not that we know each other) and Professor of Behavioural Science at the London School of Economics Paul Dolan. 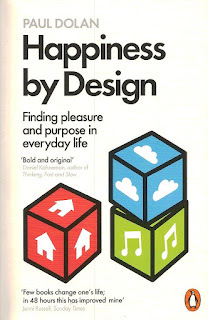 The book is interesting for two main reasons: first, like other books on happiness, it covers a lot of useful research, including Dolan’s own contribution to the work on happiness – he was heavily involved with specifying the measures on happiness which are now included in the work of the Office for National Statistics. But Dolan focuses on the personal, showing how to implement findings from the research. The second half of the book includes practical tips to help us be happy. Not by thinking about it, and not by devoting ourselves to 24x7 hedonism (which would be pretty exhausting). Rather, by using insights and techniques from the behavioural sciences. And concentrating on finding the right balance between pleasure and purpose. At the risk of stating the obvious, the book recommends that we spend more time on the things that make us happy, and less time on the things that make us unhappy – happiness comes from what you do, and what you don’t do. Which might even mean chucking in your job if it’s causing unhappiness - although it might be easier to quit the old job than find a new one which will make you happier. Which probably brings us back to traditional economics. As Thomas Carlyle might agree. Rethinking Economics is an international network of rethinkers working together to “demystify, diversify and invigorate economics.” It was great to be asked to write a chapter on Behavioural Economics for their forthcoming reader, “An Introduction to pluralist economics,” to be published this year by Routledge. It’s equally delightful that the draft has now been set to the editor! Each chapter of the book will contain a brief introduction to a different field of economic thinking, written by an academic in the subject, plus a case study co-written by a student. More details here. "There is always a well-known solution to every human problem - neat, plausible and wrong." The Behavioural Insights Team has now posted the videos from the plenary sessions, individual streams and workshops from the London Behavioural Insights Conference BX2015. So, no excuse for not catching up with all the latest material from behavioural economics and behavioural insights as applied to behaviour change interventions and policy. Click here. If you don’t have time to watch all the videos, following, as a public service (we were there, in real time), is our pick of the quotes from the sessions which we attended. Advice to those trying to influence policy makers: “What is preventing people doing the things that you want them to do? When you implement the policy who will be the losers and what will they do to you? “Corruption is not about knowing that something is wrong – it’s about putting it into a place where you don’t care about it.” (e.g, not in the box marked ‘family’). ©behaviourworkshops. Simple theme. Theme images by centauria. Powered by Blogger.